The Dark Knight Rises is one of the biggest movies of the year. If you're headed to the movie theater this weekend, why not go in style? Show your support for the film by dressing Batman style! No. Don't buy that Batman kid's mask from the dollar store. Wear a cool t-shirt! Our contest sponsor is RedBubble.com, so I thought I'd share some of the awesome stuff they have available based on the latest Batman film. Here's a subtle, but awesome shirt design. 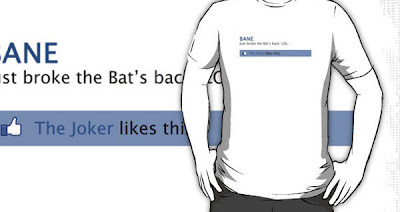 The police are under siege in Gotham City, but you can support them with this shirt. A great tribute to the masked man himself: Bane. In the movie the Gotham City Knight are a football team, but this t-shirt is close enough. Show your city pride. Bane's most chilling quote is featured on this shirt. The lipstick kiss from the movie poster is featured in this shirt. It's adaptable. Seen in The Dark Knight Rises viral marketing campaign. Bane's Facebook status after his encounter with Batman. The best part is the Joker likes it. Show how much you love director Christopher Nolan with this t-shirt. They call him “The Governor” on set. He can do no wrong. Stylized off the comic book version of Bane. This shirt makes you do a double-take. Batman and Star Trek fans come together with this Joker stylized Spock. By the way, if you like RedBubble why not become a twitter follower? They get a chance at a $50 gift certificate! What do you think of the shirts? Have you been to RedBubble yet? Caption This Star Wars Picture to Win Geek Twins Swag! I'd most likely wear Legend, but In Nolan We Trust is awesome! So is the Spock one. That would go over well at Trek conventions. those are very cool... i think as a star trek nut, the spock one wins... i have a few cool ideas for the new superman film... as i was on the set and took some cool behind the scenes stuff of things that probably didn't want me to shoot. Alex, those are good. If someone buys the Spock one they can wear it twice a year at conventions! Jeremy, you were on set?! Wow. You'll have to blog about it when the film comes out. You should put some stuff on Redbubble. I love your designs. Pat, shirts can't contain your awesomeness that's all. i took photos of signs that were not real, but it was smallville... so i thought i would turn some of their signage to fake company shirts... here is some links to structures that were in town, last summer... wow. Jeremy, it just goes to show how much I've missed by not following your blog! I like the Spock one best. Cool shirts. I like the GCPD shirt and the Cat Woman's Kiss shirt. Crime Fiction with a Kiss. How cool is that? LOL! I'd be most likely to wear the Dark Knight Legend one. It's simple and awesome. Tony, sometimes simple is better. Bane's Facebook status is humorous. I would like the GCPD shirt, but they are so damn inefficient, it would be hard to want to recognize them.